July Patient of the Month, Joe M.
Congratulations to Joe for being our July Patient of the Month! 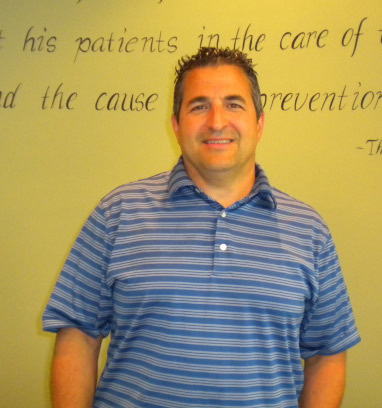 Joe started care at Precise Chiropractic in December 2011. Prior to starting care, Joe suffered with arm pain and lower back pain for over 10 years. Joe has greatly benefited from being under care at Precise Chiropractic. “My work requires me to be on my feet for long periods of time and now I am able to stand all day long without being in pain! I am a very active individual and love doing a lot of outdoor sports like golfing, boating and jet-skiing. NUCCA has allowed me to do all of the things that I love doing pain free!” he says. When asked to describe his visits to Precise Chiropractic, Joe says that he loves coming to the office! It’s always quick, painless and simple. I make sure that I stick to my every two week maintenance schedule to ensure that I continue to feel great! I am a firm believer in preventative care. My entire experience with Precise Chiropractic has been great!